Cunard and venerable jazz label Blue Note Records are proud to announce an exciting entertainment partnership, which will debut on Cunard’s flagship, Queen Mary 2, on 29 October 2015. Passengers onboard will embark on a very special Transatlantic Crossing, featuring intimate jazz performances by the Blue Note 75th Anniversary All Star Band, Our Point of View, formed for the label’s milestone anniversary in 2014. The supergroup celebrates the vitality of Blue Note by looking ahead and assembling leading young artists on the Blue Note roster who steadfastly continue to move jazz forward. Featuring keyboardist Robert Glasper, trumpeter Keyon Harrold, tenor saxophonist Marcus Strickland, guitarist Lionel Loueke, bassist Derrick Hodge, and drummer Kendrick Scott, the band’s repertoire draws from each of these artists’ own remarkable catalogs as well new spins on Blue Note classics. President of Blue Note Records, Don Was, who himself is a celebrated musician and Grammy® Award winning producer for Bonnie Raitt and the Rolling Stones, will also sail on the voyage and participate in Q&A sessions. Jazz lovers can look forward to two more special cruises in 2016, and Don will personally hand pick those artists from Blue Note Record’s renowned group of musicians. This unique partnership celebrates the two historic, yet innovative, industry leaders. Founded in 1939 by Alfred Lion, Blue Note Records is the most revered and longest running jazz label in the world. Embarking on its 175th anniversary in 2015, Cunard was the first to offer regularly scheduled Transatlantic service and has been carrying passengers between continents with luxury, sophistication and sense of occasion ever since. Through the decades, Blue Note Records has recorded countless legends including Thelonious Monk, Miles Davis, John Coltrane, Horace Silver, Herbie Hancock, Norah Jones and Van Morrison. 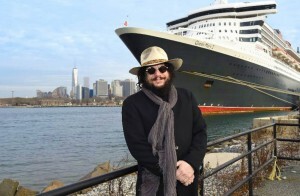 Cunard is known for offering guests unique access to some of the most beloved musicians and entertainers in the world, including James Taylor, Carly Simon, and the late jazz legend Dave Brubeck. Passengers on upcoming jazz voyages will rub shoulders with the jazz greats of today, and be treated to a series of unforgettable live performances in elegant Queen Mary 2 spaces including the world class Royal Court Theatre, with special evening performances in the ship’s Illuminations theatre.